The Standalone museum display version is here. This is a software simulation of the Triadex Muse that runs in a browser. 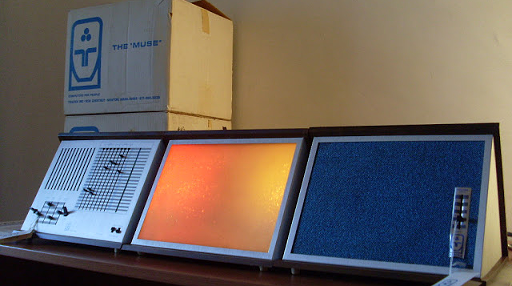 The Muse was a digital algorithmic music composer invented in 1969 by Marvin Minsky and Edward Fredkin at MIT. It was built with the digital logic circuitry of the day; gates, registers, and counters. While strongly associated with electronic music, it was not a "synthesizer" as it only played a fixed level square wave. It actually created original melodies, not from random numbers but from algorithmic processes, something that hadn't been seen before. Minsky and Fredkin formed Triadex to manufacture the units, which sold for $300.00. Accessories included an amplifier and a light show in matching enclosures. Multiple Muses could be linked together and synchronized. The Muse is incredibly rare; one report claims that only 280 were built, and a small fraction of those are likely in working condition today. And that's a shame, because this was a remarkable device and we can learn much from it. So I recreated the Muse in software (from the available leftover DNA, Jurassic Park style), so it can be appreciated. And I find the Muse's processes absolutely fascinating. There are 14 slider controls here. The START-RUN-OFF switch turns the unit on and off, and can reset the state to the beginning. The AUTO-HOLD-STEP switch controls whether the sequence is running, or stopped, or advances a step at a time. The REST switch turns the lowest note into a rest. The composition process is controlled by the eight 40-position vertical slide switches labeled INTERVAL and THEME. I describe their operation in more details below. So click on RUN and click on the INTERVAL and THEME switches to get it going. Here are some "compositions" transcribed from the User Manual. Click on one to load it into the Muse. The matrix area covers eight 40-position vertical slide switches, four labeled INTERVAL and four labeled THEME. The 40 rows are labeled OFF through B31. Each row has a binary value indicated by the blue or green lamp on the right; 0 when the lamp is off, 1 when the lamp is on. Steady 0 and 1 values. The clock pulse, a sqaure wave that triggers the rest on the high-to-low transistion. A 4-bit binary counter incremented by the clock pulse, counting 0000 to 1111. A 2-bit binary counter incremented every 3 clock pulses, counting 00 to 11. A 31-bit shift register; each clock pulse shifts the contents down one bit, and a new top bit is supplied by the THEME switches. The four INTERVAL switches select from the binary sources to set the pitch. INTERVAL A, B, and C, are binary weighted 1, 2, and 4, respectively, and map into a major scale; Do, Re, Mi, Fa, Sol, La, Ti, Do. INTERVAL D raises that pitch up an octave. Note that a major scale has 7 notes, while a 3-bit binary quantity has 8 values, so there is one note of overlap. The four THEME switches select from the binary sources to feed the next value to the top of the shift register, B1, on the next clock pulse. The four selected binary sources are combined with an Exclusive NOR function, providing a 1 for an even number of ones, or 0 for an odd number of ones. The default THEME sources are all zeros, so the shift register fills with ones when started. The counters provide repeating patterns. The 4-bit counter repeats every 16 counts. As the clock pulse is a square wave, including the clock pulse effectively doubles the count to 32 (which explains the funny name C 1/2). Or you can triple it to 48 by including the 2-bit counter and get some 3-against-4 patterns in there. Or both for a 96-note pattern. The shift register can provide delayed versions of a combination of those signals. Or it can recycle a pattern by feeding back a single B output. But the really interesting things happen when two or more shift register signals are fed back to the top with the THEME switches. We call this a Linear Feedback Shift Register (LFSR) and it has many very interesting properties. LFSRs find uses in generating pseudo-random number sequences, generating noise, data encryption and decryption, error detection and correction on streamed data, and much more. Here is a demo where you can try out an LFSR by itself. This is simplfied to 10 bits and a 2-input exclusive NOR, but you can see how patterns cycle and evolve. In the Muse, with 31 bits, the LFSR sequence can be up to 231-1, or 2,147,483,647 steps before repeating. But that's with just the LFSR by itself; in practice the LFSR is also fed with the binary counter sources, creating many more variations. It's possible to create all sorts of interesting patterns, and patterns of patterns, that grow and evolve. Creating repeating scale patterns with just C1, C2, C3, and C4. Combine the binary and 1/3 rate clock, C3 and C6, for some interesting 4-against-3 patterns. Up to 16x6=96 notes long. Use the XNOR gate on just the counters to generate variations of the counter bits. Then delay those variations down the shift register. There are a ton of tricks with just the LFSR feedback taps alone. You can run a 4-bit LFSR, for a 15 note sequence, against the divide-by 16 counter, for a weird 240 note pattern. Have a theme develop over time by just adding an XNOR tap down the line. Include various longer notes (half, dotted-half, whole) by carefully tapping off the shift register. Even the fixed ON position is useful; crank the Major scale up to a Dorian mode, or turn the XNOR into an XOR. There are a whole world of patterns available by setting the THEME switches to include both LFSR feedback taps and counter outputs. There really is a lot here. It's deeper than one would think at first glance. The Muse does this with two different counters and an LFSR. A single counter with a binary weighting plays a scale. A single counter with any other weighting provides a riff, a repeating figure. Use both counters for a sequence with repeating intervals from different starting points; that's a pattern. Use the shift register without feedback to delay a counter output for call and response, or another style of pattern. Use the shift register with two or more feedback inputs and you'll see patterns in the Theme section that grow, shrink, and change in very interesting ways. Use multiple taps off the LFSR for other interesting patterns. Combine the counters with the LFSR, and you've got thematic variation. You can tweak the balance between the predictable and unpredictable, with patterns within patterns. It's not easy or obvious, but the mechanims are present. The Muse was designed with 1969 technology, and it's easy to forget how severely limited the available selection of digital integrated circuits was back then. At the same time, new functions were being introduced at a rapid rate. From the photos on the MuffWiggler thread (refs) there are 29 chips, probably TTL logic. There are 7 chips in a line, probably 7406s, that drive the lamps (not LEDs). The counters might be be 7474 D-flops. The shift register appears to be implemented with 3 24-pin packages providing 10 bits each. The pitch is generated with a "divide down" approach; the INTERVAL A,B,C signals provide preset values for an 8-bit counter that divides a high frequency clock to the diatonic (major scale) pitches. After the oscillator, a flip-flop generates a note an octave below, and the INTERVAL D value switches between the two. It's a pretty complex machine for a 1970 consumer product. 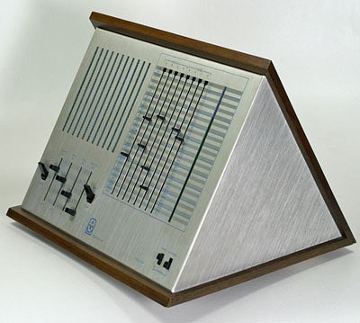 Fredkin and Minsky filed a patent, "Digital Music Synthesizer", in 1970, granted in 1971. The patent is quite different than the final product, but that happens a lot. The patent does not include the counters, and mostly centers around the LFSR and pitch generation. The pitch generation presented in the patent is interesting, and takes up the lower half of the figure. The 3-bit note code (INTERVAL A,B,C) is used to look up a binary value proportional to frequency, that value is added to a 16-bit accumulator, and the carry bit triggers a flip flop. This is similar to the way modern software oscillators work. But a 16-bit accumulator would have been expensive to implement in the chips available at the time. So the mechanism here uses a 1-bit adder on a recirculating 16-bit bit shift register. (!!!) And the frequency binary value that was looked up is also scanned in sync. (!!!) The divide down approach used for the final product is much more practical. The patent also suggests some advanced features such as occasionally adding a grace note or switching between quarter and half notes. I've tried to make this as true to the original as possible, based on the Triadex manuals, the patent, and scrutinizing some terrible videos in slow motion. It would be great to see a demo video by someone who actually knows something about the machine (and owns a tripod). If someone wants to build a hardware Muse, the big issue is going to be finding a source of 40-position slide switches. The circuitry itself is straightforward, although you'd probably want to implement it in a small processor. This implementation was intended to be true to the original, but it can certainly be extended to include a better voice, multiple INTERVAL sections for multiple voices, multiple Muses synced together, rhythmic variations such as eighth notes, quarter notes, and half notes, different scales, add accidentals for passing tones or modulations, a chromatic scale for a variation on 12-tone serial music, and much more. The Muse's set of compositional processes is worthy of a ton of study and development. I can imagine a cross between a Linear Feedback Shift Register and Nicolas Slonimsky's Thesaurus of Scales and Melodic Patterns. 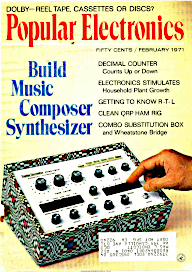 I first heard about the Muse in the February 1971 issue of Popular Electronics Magazine. The cover story was a Don Lancaster project called the "Psych Tone", a digital music composer similar to the Muse, but much simpler. It used a small 6-bit LFSR and with interesting variations. And the article included a short description and photograph of the Muse. I was about 14 years old at the time, and became fascinated with Linear Feedback Shift Registers. I scribbled lots of sequences on graph paper, and then designed and built my own version of the Psych Tone with lots of hooks for experimentation. My high school physics department had a Hewlett Packard HP 2114 16-bit minicomputer. (The word "minicomputer" sounds ironic today, but that's what they called them.) And my first programming project on that was, of course, a 16-bit LFSR, written in HP assembly language. The program displayed the sequences on the lights on the machine's front panel. 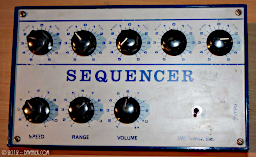 Around 1974 I designed the Sequencer manufactured by IW Turner. This was not an LFSR, but rather a study of 32-note sequences based on a 5-bit binary counter. Like the Muse's binary counter, this was a 4-bit counter with a square wave clock for the 5th bit. The knobs weighted a mix of the bits with both polarities to drive a simple VCO. The simple setup provided an impressive variety of sequences. You could weight them positive binary for an ascending sequence, weight them negative binary for a descending sequence, and then explore interesting combinations and patterns from there. This unit had a linear VCO, and one of the notes in the sequences was always lower than the others, and it would often come out as a fart at the end; "deedle-deedle doodle-deedle doodle-doodle phhhttt". And that was a charming part of its character. My dad called it the Goofy Beeper. US Patent 3610801, Digital music synthesizer, Filed Feb 16, 1970, Granted Oct 5 1971. 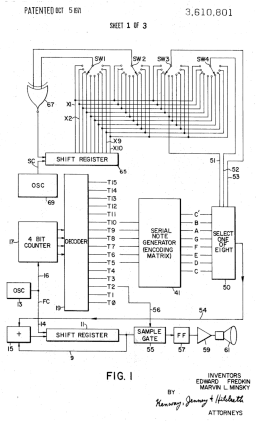 Hal Chamberlin, Musical Applications of Microprocessors. 1980. Long out of print, but you can find a pdf version if you look. The description here is very helpful on the whole, but many details are inconsistent with more definitive sources. Tridex Muse in the London Science Museum collection. MuffWiggler thread, Triadex "The Muse" pics and sound clips, 2010. Interesting photographs of the internal construction. Don Lancaster, Build the Psych Tone, Popular Electronics magazine, February 1971. The entire February 1971 issue of Popular Electronics magazine is a good read. Popular Electronics magazine is beutifully archived at American Radio History. Nicolas Slonimsky, Thesaurus of Scales and Melodic Patterns, 1947. Photos grabbed from 120 Years of Electronic Music and Matrixsynth. Updated Oct 28, 2018: Fixed some inaccuracies, added the LFSR Demo, added more descriptions, the patent, the personal story, etc.